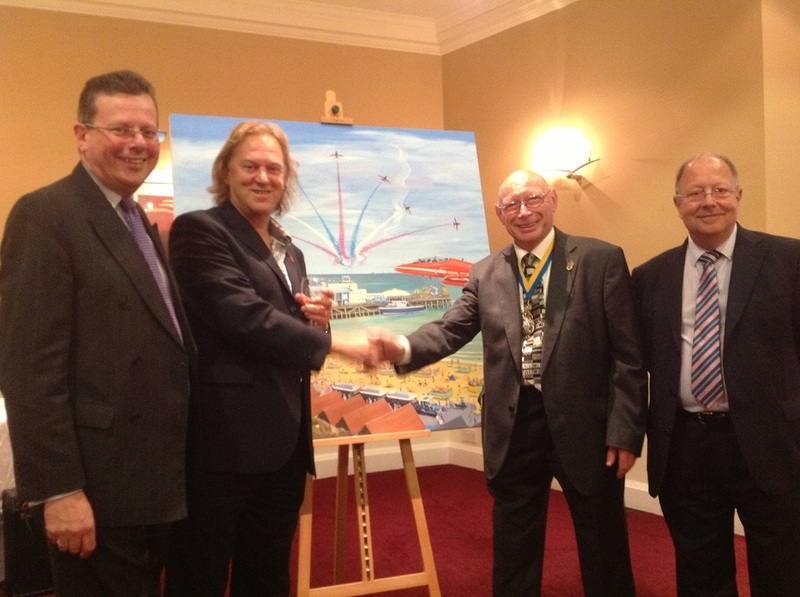 David Bent’s much anticipated Bournemouth Air Festival painting entitled ‘WOW’ has been presented to His Worshipful the Mayor of Bournemouth Councillor Chris Mayne on behalf of Air Festival organisers and the people of Bournemouth at the official ‘thank you’ party. 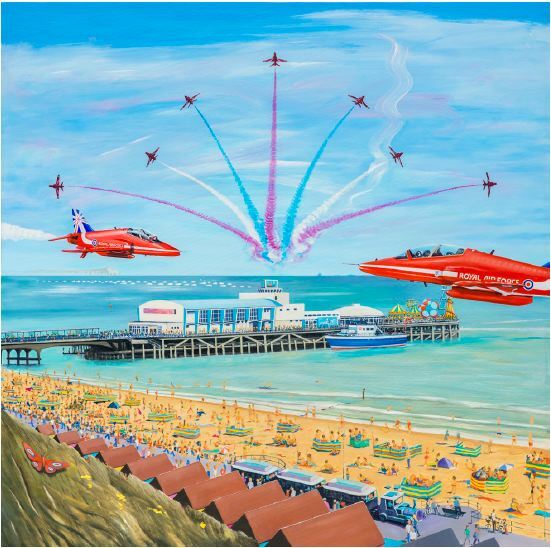 The stunning painting features the world famous RAF Red Arrows performing their spectacular display over Bournemouth Pier, to the delight of thousands packing the beaches, pier and promenade. In the foreground of the picture, the Synchro pair, Reds 6&7 are flying at high speed just before they perform their heart stopping ‘Gypo break’ manoeuvre. In the background the rest of the team are performing the iconic ‘Vixen break’ move. ‘WOW’ is full of small but pertinent details including Royal Navy ship RFA Argus on the horizon, the land train on the promenade, the seafront beach huts, a familiar face or two, Royal Marines on the beach and a mysterious Red Arrows butterfly fluttering over the cliff banks that slope down to Bournemouth beach. Councillor Lawrence Williams, Tourism Portfolio Holder said; “We are truly delighted to have hosted David as our first official artist in residence and the finished artwork is just fantastic – he’s certainly captured the Festival’s colour, creativity, vibrancy and unique atmosphere.” Jon Weaver, Air Festival Organiser added; “David is world renowned for his leading aviation artwork and ‘WOW’ has embodied this. The piece is a great introduction to his fantastic art exhibition which is coming to the Russell Cotes in 2016”. WOW will be on display at the Bournemouth Library, The Triangle from the middle of next week (commencing 20th October) for 4 weeks until it moves to other public spaces.